Every one of them looked good and they all did fairly well out of the 9 GOP primary contenders at the CNN debate last night. Of course there were winners and there were losers so let’s list who did what and why. I do seriously mean it that every one of the Republican contenders seeking nomination for the GOP primary looked good and presented themselves well. Of course some did better than others, as is always the case. Let us begin with the contenders in the lower percentiles in terms of polling. Rand Paul intriguingly, did a great job and he shows up in many impromptu polls high in the standings. Attempting a nice honesty here, I don’t much listen to Paul as he’s not my guy and within this group currently running, he’ll likely never be my guy. However, if he should, miraculously get the nomination, I’d for sure vote for him. Attention all Rand Paul lovers, YOUR GUY AIN’T GOING TO GET THE NOMINATION! That’s my summery of Rand Paul. Carly Fiorina looked terrific, yes she did. And she answered questions well. Still, I got to looking over this field of contenders and I pondered….why this woman? So she was once head of Hewlett-Packard, how is that any stairway to the presidency? Hold on, yon ladies and gems, I know that Trump also heads a business and Ben Carson is by golly a surgeon, jobs hardly considered stepping stones to the most powerful position on the planet. And goodness rumors abound that Fiorina totally messed up Hewlett-Packard, removing even that tenuous claim to fame of being CEO on her resume. Last night I regarded Fiorina thoughtfully and it’s only my take, guys, and I’m wrong from time to time, but I simply do not see her getting the nod. It’s possible, but not likely, as I assert, that she might get a VP slot. New Jersey Governor Chris Christie was once a prosecutor, did y’all know that? If you didn’t, y’all ain’t been listening to the NJ Governor enough because he lets you know every five minutes. Further, and more odd, he often asserts that it was this position that somehow makes him an expert on terrorism. I suppose that there were some terrorists or wannabe terrorists that Christie prosecuted and being Governor of a state does involve keeping up with potential terrorist actions. But the man is NOT an expert on terrorism because he was once a prosecutor and I wish he’d quit saying so. Besides I still hold that nasty and mean shutting down of the Washington Bridge against him and if yon reader would declare Christie didn’t know a thing about it, I got a bridge to sell….cheap. Not real sturdy in heavy winds but on sunny days it’s a gem. Speaking of endless repetitive sound bytes, did y’all know that Ohio Governor John Kasich’s father was a mailman? Which means what because employees of the US Postal Service are well paid, good benefits, pensions…..are we supposed to think a mailman is poor and pathetic? I really dislike John Kasich, dislike him intensely. But yes, should he win the primary I would vote for him. I’d hope he’d give some of the sneering he gives to folks like me who refuse to see his genius and why he should have this job, damn it….to some of those Mideast tyrants. Kasich was same old belligerent and derogatory self last night and here’s for yon readers….KASICH AIN’T GOING TO BE THE GUY, WRITE THAT DOWN! Reluctantly I put Ben Carson in this part of my assessment, the part of the narrative where I list the losers, as I see it, of course, and yon readers’ mileage will surely vary. I’d sure like to see Dr. Carson begin some kind of ascent into politics, perhaps as a Representative in America’s House then a move on up. I just don’t think it’s time for Carson to be elected to such a hugely important office. Some political experience, much as I hate to even by typing such a thing, would benefit Dr. Carson. Going to what I consider the top half of the primary ticket, I softly begin with he who should, statistically, be at the BOTTOM of the ticket…..Former Florida Governor Jeb Bush. Recall, yon ladies and gems, that at the very beginning of this year one Jeb Bush came out, to bugles and fanfare, to announce his intent to run for President as the GOP nominee. The media cheered and the GOP elite applauded. I do believe that big shiny, sparkly announcement was meant to set the tone for how it was going to be,….us fools should get used to Jeb Bush as, at the time, he has all the money. He’s still, though not quite so much as back in February, he’s a force to be reckoned with. If nothing else, politico types watch Bush to see how someone once so full of himself can fall so fast. Jeb Bush was positioned next to front-runner Donald Trump. Donald played for the camera and it kind of made Bush look dumb. Bush didn’t do bad, he answered the questions handily. But let’s face it folks, at this point most of us remotely following this race know the story. Right now it’s just repeats for those gradually joining in as the election draws near. Now, Bush will never be perceived as a debate and policy genius even should he suddenly become one. Heh. Jeb Bush’s backstage debate room. Marco Rubio did real good but the other people got him good with their references to Rubio’s ill-advised signing up with that “Gang of Eight”. Folks, this country desperately needs to sit down and have a discussion about immigration into this country and the electorate, silly peasants, keep rising up to demand it. For we all have doors and locks and out here in la-la land where we carry this country on our backs, fences are well known to make good neighbors. Sure we have outrageous phrases thrown out about barring all Muslims and Jeb Bush who says they break our laws by violating our borders with great love. It’s okay….really, a national dialogue. What we DON’T need, and I don’t care how damn guilty they try to make us feel, is to just let everybody into this country just as we don’t let everybody into our house. Any politico who, however well-intentioned giving benefit of doubt, signs up for what is perceived, if not specifically stated, for blanket amnesty. Rubio’s opposition, all of them, mentioned his gang of 8 silly move and good for them! Being super-polite won’t get you elected. Donald Trump comes in second by my assessment though he didn’t come up with any great wisdom. And I do kind of get tired of Trump constantly saying how someone is “nice”….this one is “nice”…BUT….that one is “nice”…BUT. And I suppose that Trump constantly mentioning he is top of the polls is good strategy but I dunno….I don’t think Trump’s at the top of the polls because he’s necessarily going to win. I think Trump rides the crest of a wave for the entertainment he provides….I’m rather enjoying it all. And last night’s debate winner is….TADA Ted Cruz. First, let me get this out there….the love affair between The Donald and Cruz was very obvious. Those two have made up and I suspect the national GOP has somehow made peace, including Trump’s possible but now totally denied entrance as an Independent, including Trump calling Cruz a “maniac”….heh, I kind of like that. I do believe there is a possible Cruz ticket being compiled here and No, I do not think there will be a Cruz/Trump ticket. In fact, I think it’s possible Trump will end up in a Secretary position, Secretary of the Treasury perhaps…..there’s something going on between Trump and Cruz and I’m intrigued. So there you have, the last Republican debate of the year with two more, as I understand it, scheduled in early 2016, before the Iowa primaries. As an aside for yon readers, note that when it comes time to pull that lever, Ted Cruz soars ahead. I’m just not convinced that Donald Trump will get the Republican nomination and I’m not sure he even wants it. But I will for sure vote for him, yes I will, because I simply will not vote for Hillary. NEXT : Sunday political talk show, definitely…..much more but Christmas slows me down. 5 Comments on "The National Scene-The CNN Debate on 12/15/15"
Jose Mourinho has been sacked. Are republicans motivated by anything inspiring or just hate, fear and racial resentments? I’ve got to say that the World Surf League title race this season, which ended today in Hawaii, is possibly one of the greatest inspirational sporting ,and life scenarios that I’ve ever witnessed. Is that good enough for you, mouse? Is that a reality show? The truth finally comes out. Today, on Morning Joe, leftist co-host Mika Brezinsky faced cold, hard reality. After months of dumping on Trump, sh said that if Trump gets the nomination, the Democrats are in serious trouble. And that is a fact. The Democrats are saddled with a candidate with a record of ineptitude and more baggage than Amtrak. The “establishment” wing of the GOP went along with Obama on the budget- again. And they have- again- placed an impossible economic burden on generations yet unborn. No problem, to borrow from Keynes, they’ll all be dead. 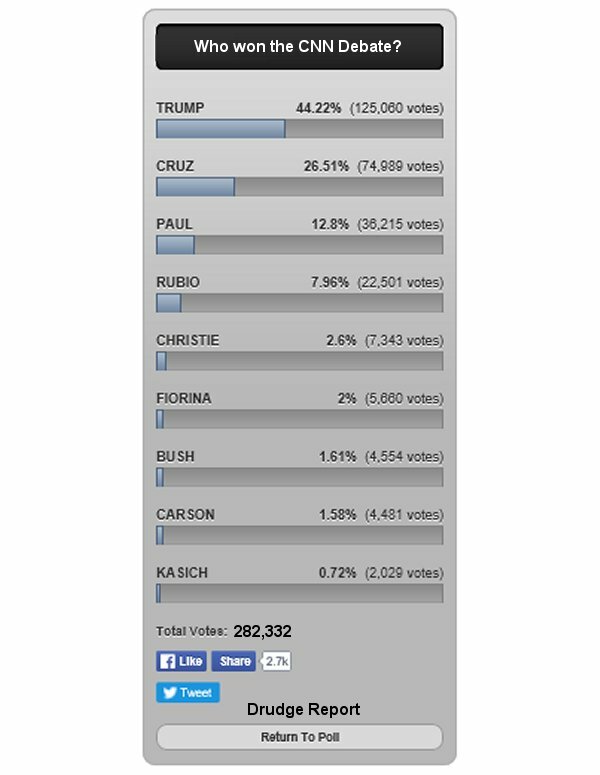 And the “mainstream” media and the GOP “establishment” are bewildered at the Trump ascendancy. Well, duh. That’s what happens when a party elite fear their own constituency more than they do the socialist opposition. In a nutshell, the budget “deal” explains all you really need to know about Trump’s poll numbers.